A millionaire's son works as a milkman for a month to win a bet with his father. While delivering milk he falls in love with a young debutante whom he mistakes for a maid. America's Favorite Sweethearts in their final pairing! 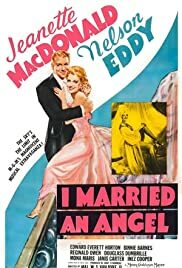 Jeanette MacDonald and Nelson Eddy star in this "modern" musical that showcases MacDonald's comic abilities. Surreal 40s musical seem to be making fun of 40s fashions even as they were in current vogue. Eye-popping costumes and sets (yes B&W) add to the surreal, dreamlike quality of the entire film. Several good songs enliven the film, with the "Twinkle in Your Eye" number a total highlight, including a fun jitterbug number between MacDonald and Binnie Barnes. Also in the HUGE cast are Edward Everett Horton, Reginal Owen, Mona Maris, Douglas Dumbrille and Anne Jeffreys. Also to been seen in extended bit parts are Esther Dale, Almira Sessions, Grace Hayle, Gertrude Hoffman, Rafaela Ottiano, Odette Myrtile, Cecil Cunningham and many others. Great fun and nice to see the wonderful MacDonald in her jitterbug/vamp routines. She could do it all.